A rare pump-action shotgun, with a 3-rounds capacity tube, a pistol grip and a detachable buttstock with a folding system. This weapon is also able to fit 8-rounds magazines made by the Italian company Valtro (known in the US as ATIS). 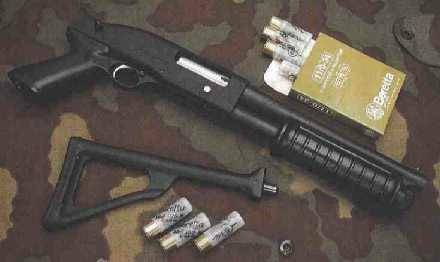 This 12-Gauge shotgun is forbidden in Italy for the civilian market It is a duty weapon with most Italian civilian and military counterterrorism forces, such as the State Police's NOCS (Nucleo Operativo Corpi Speciali, SWAT) and the military Col Moschin Regiment (Italian Navy SEALS).